The bus picked us up right outside our hotel which was brilliant, the journey from Costa Brava is very long but worth it as Port Aventura is amazing! plenty to do and see, the shows were great, food is good (if a little pricey), rides are fantastic. would definitely recommend. Day trip is not sufficient to see the park.. We only managed to see 3 shows and 2 rides in the sesame the cue is too long..we are not able to see the waterpark..the drinks and food are too expensive. 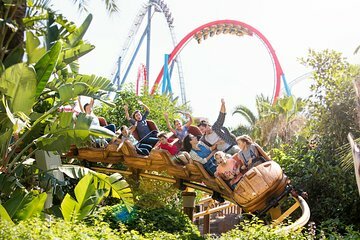 Great looking park and I´m sure great rides as well. We did spend a whole day there but only got to know about terrible lines and waiting between 1,5 and 2 hours in the blazing sun for a ride. We did pay full price for the day and expected to be able to access the rides like everyone else, but no, when we arrived you could pay a large extra sum to be able to cut the lines. It is not like you are getting extra service for these passes, only make everyone else wait longer than you. Great offer compared to other tour operators, because now you can stay in the park till 0:30 instead of 18:30.